Yesterday we revealed the 3 Expert Level Ways to Prevent Shopping Cart Abandonment. Today we cover how to build a “6-figure Shopify” by scaling with Facebook ads. Today is a special day in the Shopify business building process; as we’re going to be scaling our Facebook ads with the intention of generating a 6-figure online income. Bookmark this page because it will serve as a healthy reminder of the exact process to follow when growing your brand with Facebook ads. Don’t get emotionally involved. We are scaling what works and removing what doesn’t. $20 daily ad spend minimum. Minimum of 2 ROAS – each ad sets revenue should double the spend – if not, pause it. Ruthlessly pause and create new ad-sets early on in the process. Pick 15 initial products to promote on your Shopify store. Then create 15 Facebook ad sets – one for each product. The rules above remain. After your initial $20 spend you should be able to identify what has promise and what doesn’t. Continue to advertise only those products that are converting. Once you identify at least one winning product for your store, you’ll need to create 15 new audiences for that one product and ad. Each new combo will equate to a new ad set. Everything in terms of budget and placement will remain the same. The only thing that changes will be the targeting. Or if your winning product happens to be a particular pendant necklace, you could target Jewelry/Gifts, or Pendants/Anniversary Gift. The point is to create 15 targeted audiences based on specific combinations of interests. 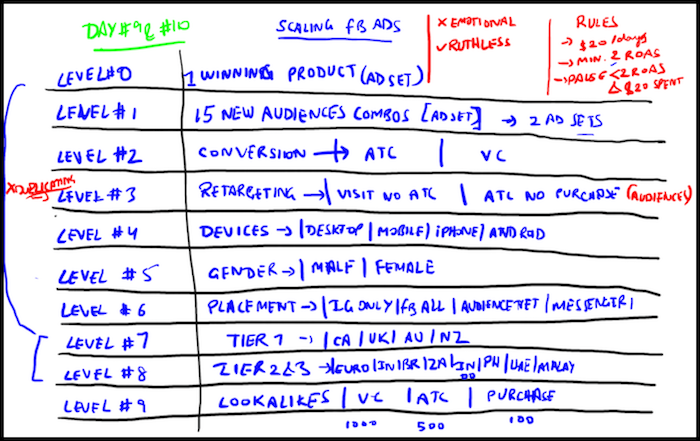 When identifying our winning products we already acted on the “Purchase” conversion metric. Be very careful not to change the ad sets that are currently working for you as this can cause an unwanted drop in sales. Simply duplicate the ads prior to creating your modified conversion metrics. Simply login to “Audiences” from within Facebook Ads Manager and create a new campaign or ad set, and build two levels of retargeting. First is going to be for those who have visited your product page but did not add anything to their shopping cart. Second we will retarget for those who added products to their cart but didn’t purchase anything. For these customers we need to very slightly modify our ad copy in order offer a discount aka purchase incentive aka that extra nudge. Again, duplicate whichever winning ad sets you have so far, then modify them accordingly in order to continue scaling. Depending on your product, specify if it’s more geared toward woman or men specifically. If you’re selling a DIY spa kit, you probably don’y want to waste impressions on a male audience. Instead target those most likely to use it – women. Or if you’re selling hunting waders, that would likely be something you would want to target men for. Utilize different ad placements for different ads. Just continue to duplicate your product ads and modify as you go. Target your largest countries first. Each ad set you create should target a different specific tier 1 country. Typically we want to wait until the Facebook ad for the converting products sales page gets viewed at least 1,000 times or has been added to the cart at least 500 times. Level nine will be one of the most important steps you take when scaling your ads, as you have already proven them to convert so you are essentially beginning the process over from level zero at this point. We do this to keep the demographic fresh and the CPC low while maximizing our reach and simultaneously cornering the market for whichever products we are promoting. That’s a wrap for Day 12 – Great work! P.P.S. Click here for Day 13! Hows the Tier 2 countries performing? Are deliveries reaching ? Any complains so far? I tried it for a day, and then moved focus back to US. I’ll be trying Tier 2 and 3 countries once we’ve exhausted Tier 1 countries. That’s a good strategy to have for now.